Park Slope gets its first Vietnamese joint in the just-opened-on-Saturday Hanco's. What took them so long? 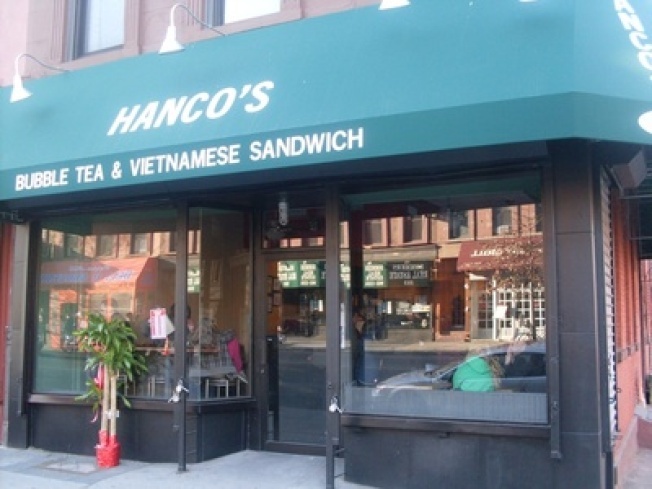 Hanco's: Finally, Vietnamese in Park Slope. If you live in Manhattan under 100th Street, you have a Vietnamese restaurant nearby. You just do. And you take all that on-demand lemongrass deliciousness for granted -- until you move to Park Slope and realize you may as well be in a suburb of Omaha. Save for a couple of sushi joints, the Slope is pretty much an Asian food wasteland anyway, but until now, if you craved banh mi, you had to head to Sunset Park's Chinatown, up to Boerum Hill, or back into Manhattan. So Saturday's grand opening of Hanco's Bubble Tea and Vietnamese Sandwich, on 7th Avenue at 10th Street, was major news. Hanco's -- which already has a joint on Bergen Street in Boerum Hill -- doesn't do the full roster of Vietnamese (sadly, no pho), but no matter. The arrival of a very good classic banh mi -- stuffed with pate and ham and charred pork and pickled things -- this side of Prospect Park means we won't have to get on the D train at 9PM to satisfy our craving. They have bubble tea, too. F***ed in Park Slope has shots of the opening and the menu.